Śāriputra (Pāli: Sāriputta; Chinese: 舍利弗 Sheli Fu) was one of two principal disciples of the Buddha. 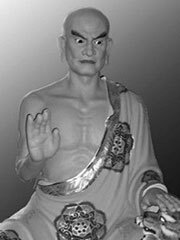 He became an Arhat renowned for his wisdom and is depicted in the Theravada tradition as one of the most important disciples of the Buddha. Śāriputra came from a brahmin family and had already embarked on life as a spiritual ascetic when he encountered the teachings of the Buddha. Śāriputra had a close friend Mahamaudgalyayana, another wandering ascetic. They both renounced the world on the same day and became disciples of the sceptic Sañjaya Belatthiputta before converting to Buddhism. After hearing of the Buddha’s teachings from a monk named Assaji, Śāriputra sought out the Buddha and became an adherent to his teachings. These two are often depicted together with the Buddha, and several sutras regard interactions between Śāriputra and Mahamaudgalyayana (who became renowned among the early Buddhists for his mastery of supernatural powers). In one somewhat comical scene involving the two friends, a mischievous yakkha decides that it will attempt to irritate Śāriputra by striking him on the head. Mahamaudgalyayana sees this occurring with his ‘divine eye’ (a clairvoyant-like faculty often attributed to powerful Buddhist monks, as well as other South Asian ascetics), and unsuccessful attempts to warn Śāriputra. However, due to his great spiritual mastery, Śāriputra perceives the terrible blow that the yakkha delivers as only a light breeze. Mahamaudgalyayana approaches and expresses his amazement that Śāriputra barely noticed the terrible blow; Śāriputra replies in kind, amazed at the fact that Mahamaudgalyayana was able to perceive the invisible creature that dealt the blow. Śāriputra was older than the Buddha and died shortly before him, an event that apparently caused great distress to Ananda, the Buddha’s cousin and personal attendant. The Buddha gave a eulogy. He was noted for his compassion, patience and humility. Śāriputra often preached with the Buddha’s approval and was awarded the title of ‘General of the Dharma’ (Pāli: Dhammasenāpati) for his propagation of the faith and is regarded of the founder of the Abhidharma tradition. While depictions of Śāriputra in the Pali canon are uniformly positive, showing Śāriputra as a wise and powerful arhat, second only to the Buddha, his depiction in Mahayana sources has often been much less flattering. In the Vimalakirti-nirdesa Sutta and the Lotus Sutra, Śāriputra is depicted as the voice of the less sophisticated Hinayana or sravaka tradition. He is unable to readily grasp the Mahayana doctrines presented by Vimalakirti and others, and is rebuked or defeated in debate by a number of interlocutors, including a female deity (deva) who frustrates Śāriputra’s ‘Hinayana’ assumptions regarding gender and form. A dialogue between Śāriputra and Avalokitesvara inspired the Heart Sutra, a brief but essential text in the Mahayana Buddhist tradition as practiced in Tibet, Mongolia, China, Korea, and Japan.